The Sigmund-Haffner-Gasse is a Medieval lane in the old town of Salzburg. It runs between the Getreidegasse and the the Franciscan Monastery. It is a rather wide lane and part of those areas in Salzburg that are packed with jewellery stores, luxury boutiques, galleries and other expensive stores. The Sigmund-Haffner-Gasse is one of the oldest streets in Salzburg. Its current outlay dates back to 1140, when the Franciscan Church (Franziskanerkirche) became a parish church. In the Middle Ages, Renaissance and Baroque Age, Salzburg was divided into the Bürgerstadt (Civil City) and Mönchsstadt (Monk City). The Sigmund-Haffner-Gasse was a border and concentrated some of the city′s wealthiest merchants and artisans among its residents. This is also reflected in the old city hall (Altes Rathaus) at the corner Sigmund-Haffner-Gasse/Getreidegasse. The lane was named after Sigmund Hafner (surprise), a wealthy merchant and benefactor of Salzburg. His son was born the same year as Wolfgang Amadeus Mozart, who did composition assignments for Hafner and his family. Walking through the Sigmund-Haffner-Gasse today, there are several buildings worth a closer look. Note for example the hotel "Zum Elefanten". In the 16th century, King John of Portugal gave an elephant as a wedding gift to Archduke Maximilian of Austria. 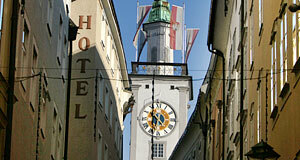 The animal went by the name of Soliman and alongside the Archduke, stayed in Salzburg in 1522. The man in charge with caring for the elephant bought the current hotel four years later and opened an inn that he named after the exotic guest. Sigmund-Haffner-Gasse 7 to 9 once served as court brewery (Hofbräuhaus), following a change in owners in 1544. Getting to the crossing at the Ritzerbogen, you stand in front of the bookshop Höllrigl, the second oldest in the German-speaking world and the oldest of Austria. The art gallery Welz is named after its founder, a very controversial art collector, art historian and former Nazi whose collection seeded the Rupertinum Museum. Speaking of that: It can be found at the end of the lane and was founded by Prince Archbishop Wolf Dietrich von Raitenau long after he had been removed from the throne of Salzburg in 1653. It was a college and dormitory for 12 to 14 students and dedicated to St. Rupert. It became an art museum only after the death of Welz in the 1980ies. The Kapellhaus (Chapel House) right next to the Rupertinum is still (or rather again) a dormitory run by the Catholic Student Association (KHG).